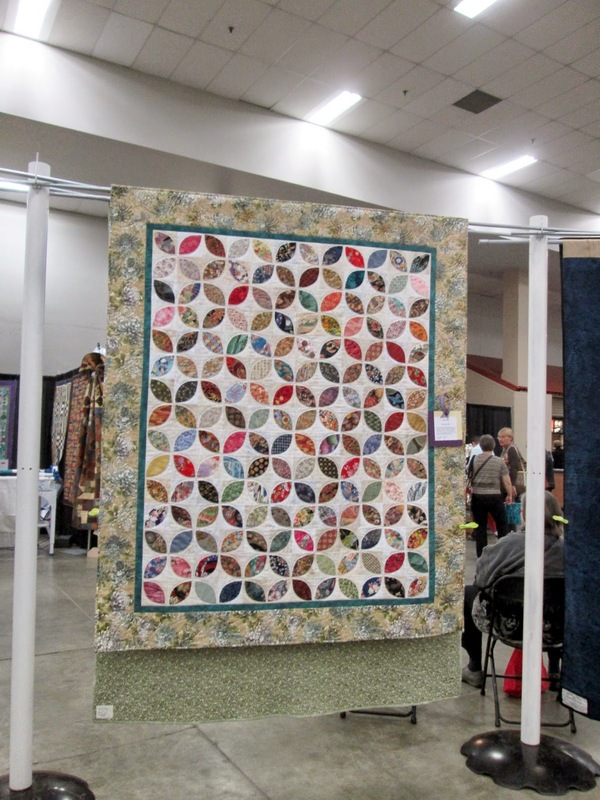 Quilt Show Season has begun again in Alberta, kicked off by the 23 Annual Central Alberta Quilters' Guild Show at Westerner Park in Red Deer. This year was a great one for friends of mine who belong to that guild -- and I couldn't miss it! Donna Deis was one of the two Featured Quilters -- meaning that she had a retrospective of her work on display, and was on hand to meet and greet viewers for the two days of the show. 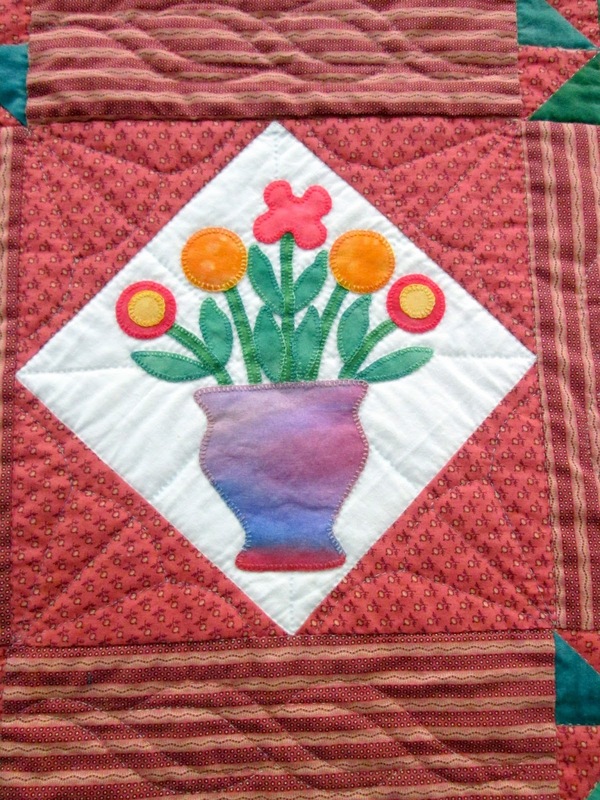 Her work is colourful, including piecing and appliqué, bed-sized quilts and wall-hangings. Like most quilters, Donna is drawn by colour, and enjoys finding a focus fabric to feature in her work. 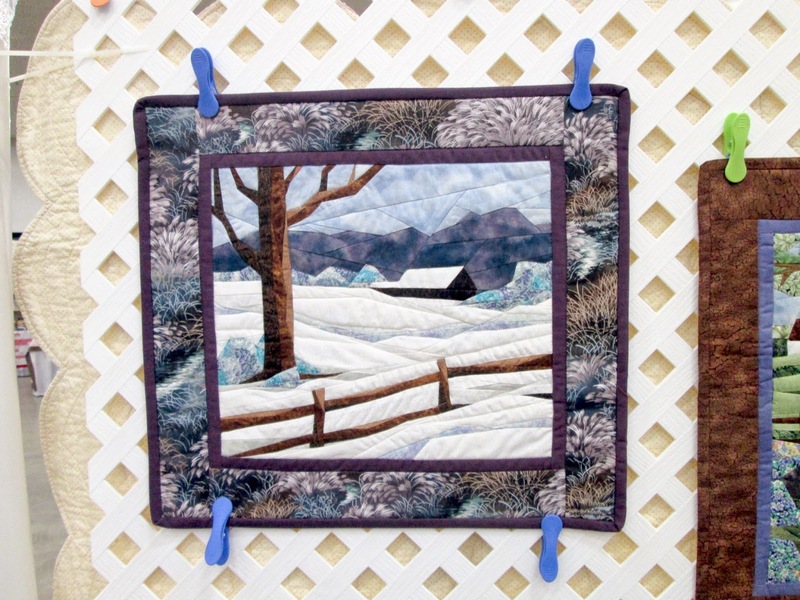 The winter landscape below, for example, began with the border fabric. Donna then selected fabrics to interpret the pattern in the palette of the border fabric. Here are two more landscapes created by Donna from the same designer's series. All are from England Design, by Cynthia England. And here's one of several of Donna's bed-sized quilts -- admittedly, one of my favourites in the display. This pattern is called "Tea Leaves"; I love its clean curves. Donna learned to do needle-turn appliqué from our mutual friend, Annette Johnston. Annette makes it look easy, but neither Donna nor I have been quick learners; Donna said it took her five years to do "Tea Leaves". The journey has been a positive one though, as she is eager to do more. 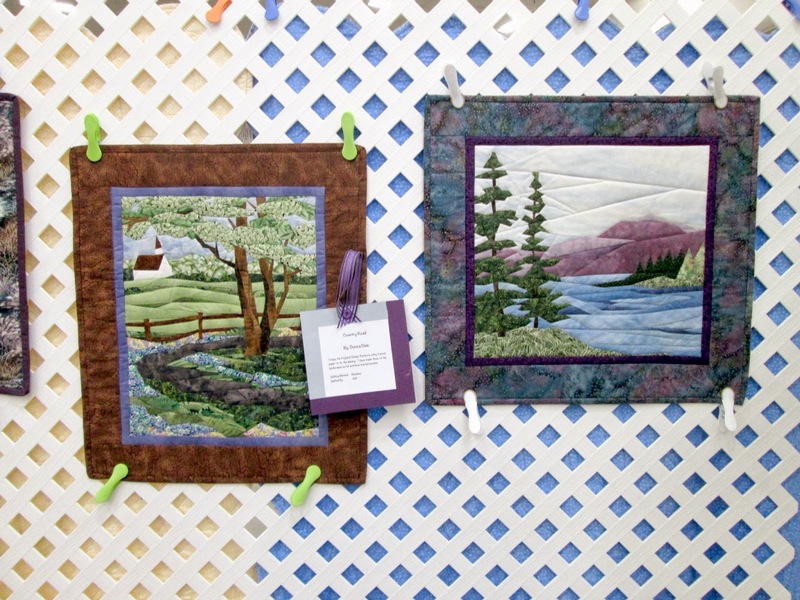 With Donna as one of the Featured Quilters, Annette decided that for the first time in several years she would enter pieces in the Central Alberta show. She selected three -- all hand appliqué and all hand quilted. 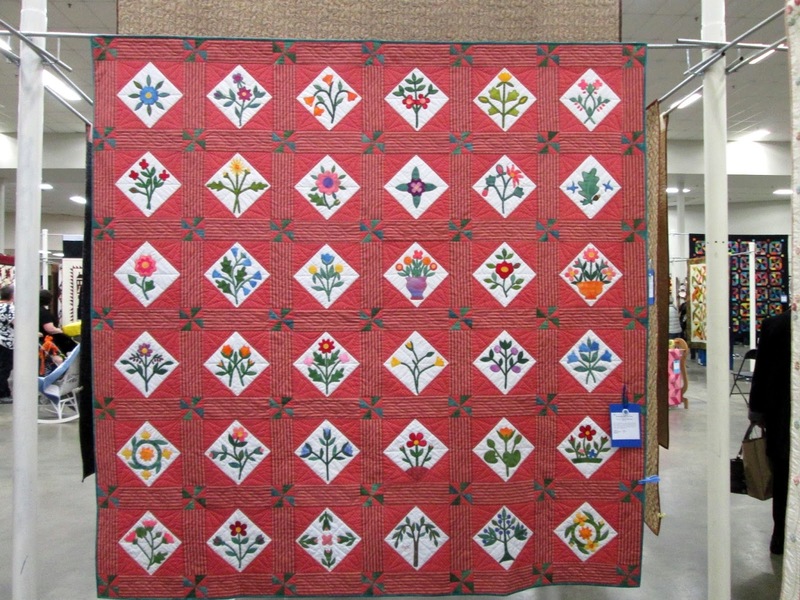 This bed-sized quilt is entitled "Remembering Sally Post" -- and features Annette's hand-dyed fabrics as well as reproduction fabrics, against a very unusual background, don't you think? Sally Post was a quilter from New York State, who made the original of this pattern back in 1954, at the age of 63. 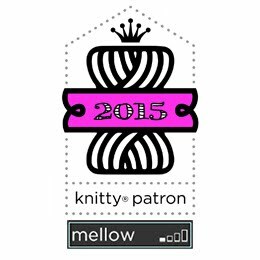 The original is now owned by Gay Bonners, who made the patterns for the blocks available on her website, Sentimental Stitches. Here's a close-up of one block, showing off some of Annette's beautiful hand-dyed fabric. 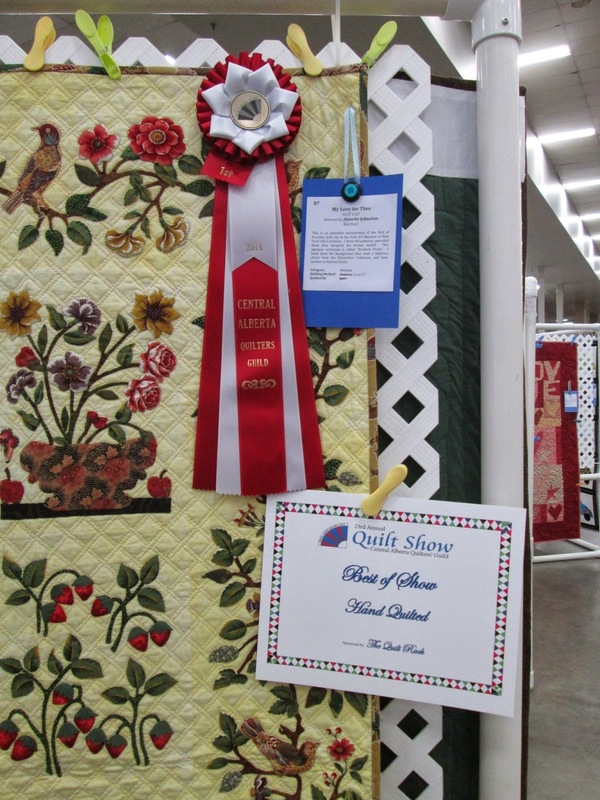 At the end of the day on Friday, prizes were awarded in each quilting category: large quilt, medium quilt, Innovative/Art quilt (any size), small quilt, machine quilted (self), hand-quilted, machine embroidered, long-arm quilting, wall hanging. Thus ends Part I of my CAQG show adventure for 2014...Stay tuned for Part II, with photos of some of my other favourites. As for my table-time for SAQA Western Canada...there will be a separate post on the SAQA WC blog. Great report and I enjoyed reading your SAQA blog post as well. Annette's work is beautiful. I was fascinated that Donna started with the border - most unusual, but looking at that fabric, I can see why. The pattern and fabrics she selected go beautifully. Looking forward to seeing more in Part II of your report. 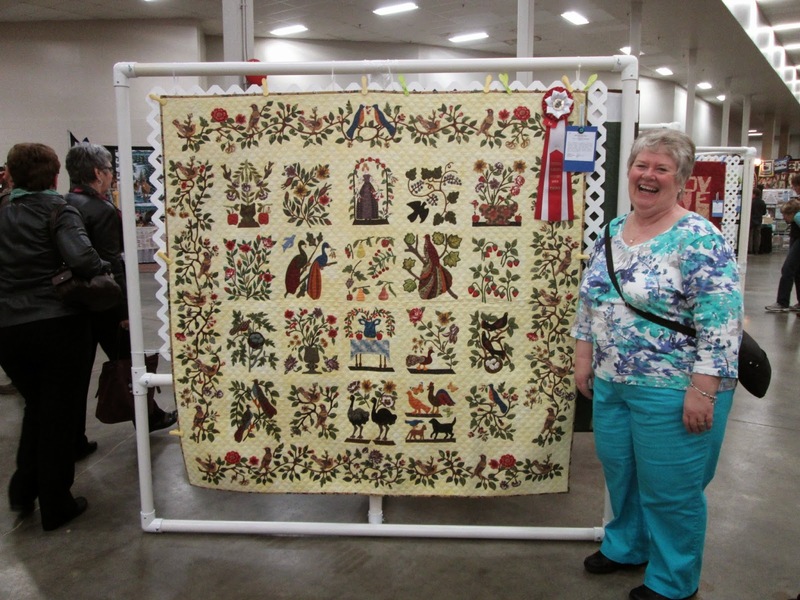 I love when bloggers post photos of quilt shows. Wish I could get to all of them! So wonderful to see this far away show through your eyes. Thanks for posting. Love...love...love, Tea Leaves. Civil War Bride by Corliss Searcey is one of my favourite quilts, so you know I'm drooling over Annette's Best In Show. It's amazing. Her hand quilting is exquisite.